Today I got the Vodafone 4G sim delivered to my home and I must say that the service was quick, I had smsed for the switch over from 3G to 4G and the sim was delivered to me within 2 days. So the purpose of this article is to test the internet speed between 3G and 4G network on Vodafone. Let’s get started! To keep this test as fair as possible. I am using the same phone (Xiaomi Mi4i) for the speed test and even the same phone number, once before porting it, while it was still on 3G and after porting to 4G. Also, the phone was placed in the exact same spot for both the tests. The screenshots you see below, on the left is the 3G (denoted by H+) and on the right is the 4G. And WOW! I am getting .43mbps download speed more on 4G, a 10% improvement. Of course i am being sarcastic, Vodafone spends thousands of crores on 4G spectrum license and this is what we get? I think i was better of with 3G. 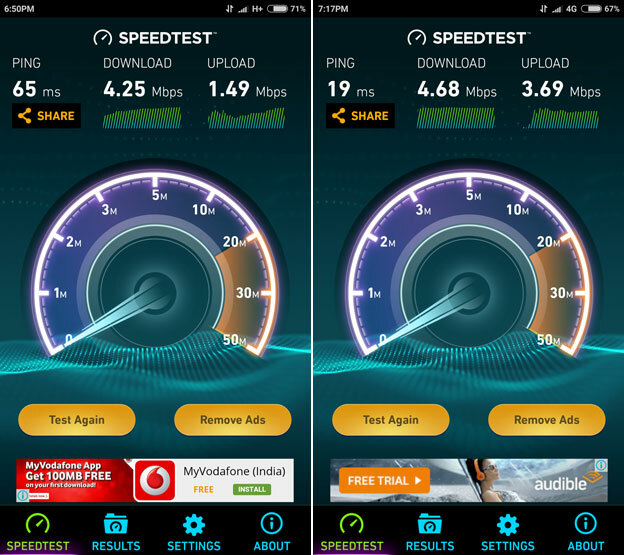 By the way, i have tested with Airtel as well and on the 3 different occasions which i tests, the results were quite similar to a 3G speed, mostly between 2-4mbps. Typically 4G LTE speed is supposed to be 10 times 3G which means I should be getting between 30-40mbps downloads but that’s certainly not the case. I hope this is not just another way to move customers to 4G for free initially and then start making them pay more while giving them the same speed as before. Please note: I am not comparing the upload speed, simply because that does not matter as much on a normal usage. This entry was posted in Telecom and tagged 3G, 4G, Speed Test, Vodafone by Prashant. Bookmark the permalink.